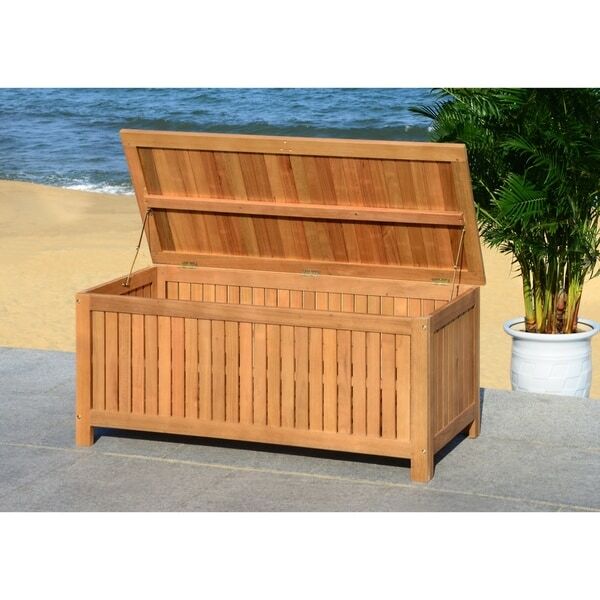 Inspired by a classic resort in North Carolina, this 47.63-inch cushion box brings charm and grace to any outdoor room. Designed for ample storage, its traditional teak finish and eucalyptus wood craftsmanship ensure it will be enjoyed for generations. Dimensions 47.6" x 19.6" x 18.9"
"Will this weather and turn grey like my teak table and chairs ?" Please store outdoor furniture indoors or cover well when not in use. Remove wooden furniture from standing water. Dust regularly with small brush or vacuum. Spills should be taken care of immediately before they harden or stain with a slightly dampened sponge. Do not use bleach solutions. "By 'assembly required' what exactly does that mean?" The item does not come assembled and will need to be put together. "Fully assembled from floor to top is exactly 19.6 Inches?" "What are the internal measurements of this?" Unfortunately, that has not yet been measured. "What are the exact measurements?" Approximately 47.6 inches x 19.6 inches x 18.9 inches.